The stained glass windows adorning Houston churches tell the stories of beloved saints, martyrs and missionaries. They provide a connection with the past that ordinary windows cannot. With such beautiful and important architecture comes great responsibility. 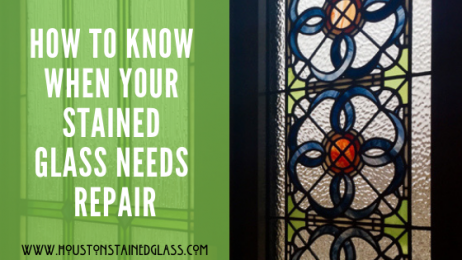 Stained glass repair is not for the faint of heart. 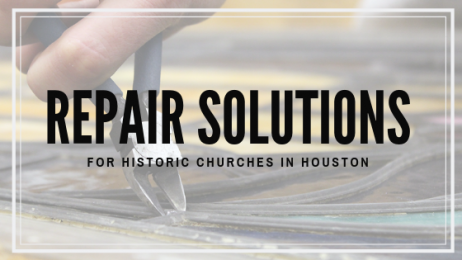 The stained glass in Houston churches is some of the oldest in the country, and as such may be in need of some TLC and repair. 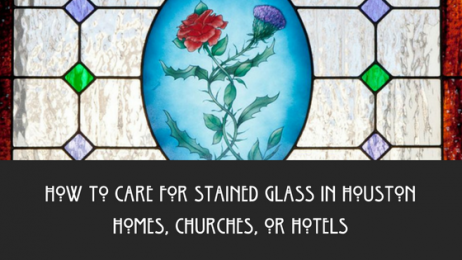 After 50, 75, and even 100 years, stained glass can begin to deteriorate. As a Houston church leader if you are looking for stained glass repair, Houston Stained Glass can help. Starting with a free consultation, we can set your mind at ease knowing your beloved stained glass is in the most skilled of hands. For small cracks or repairs, sometimes we can fix those on site. Otherwise, the glass is disassembled and transported very carefully to our studio, where the stained glass is systematically inspected, repaired, restored, and cleaned. As part of the repair process, we match your glass colors and finishes precisely. In fact, we have access to over 10,000 shades and textures of glass. We put all our stained glass between protective clear glass so the elements cannot damage it going forward. We even use innovative lead strips that look like the original antique lead caming but have extra strength and durability. The stained glass in your Houston church is a significant piece of history as well as art. We treat it with as much care as a curator as a museum treats a masterpiece, because that’s what it is. 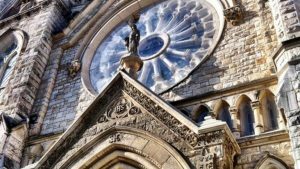 Contact the church stained glass repair specialists at Houston Stained Glass for your church stained glass restoration and repair needs. We are passionate about church stained glass repair and you can put your confidence in us. 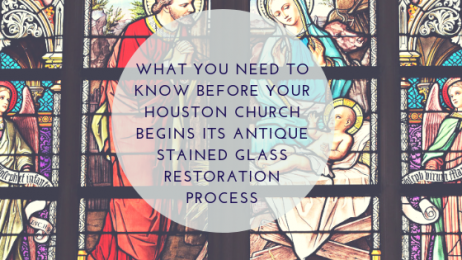 Houston is well-known for its abundance of gorgeous, antique stained glass features that are housed throughout the numerous churches of many different denominations. Antique religious stained glass plays a crucial role in the worship process that may be underestimated. Many congregation members feel that these original stained glass windows offer historical and sentimental value. Antique stained glass needs to be restored periodically in order to maintain the antique value and ensure future generations can enjoy them as well. 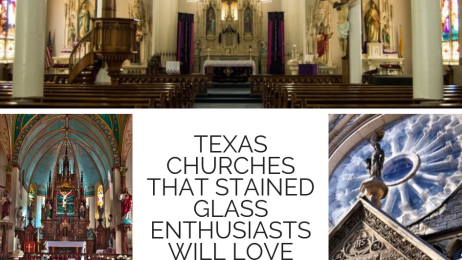 Texas and stained glass have a long and glorious history with one another As such, San Antonio and the state, in general, are home myriad to many beautiful places of worship adorned with stained glass. Our lovely state takes great pride in historic preservation of stained glass meaning us and our children know we will be able to experience the joy it brings for decades to come. Churches and cathedrals both urban and rural dot the Texas landscape and all of them have a story with cultural relevance. 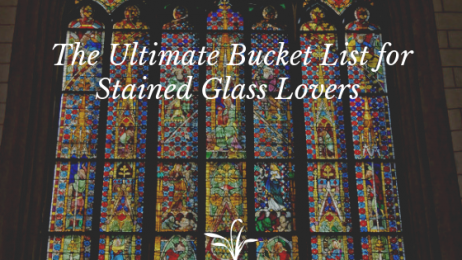 As lovers of stained glass history ourselves, we at Houston Stained Glass, have taken the time to list some of the states most lovely and historically significant stained glass and the churches they adorn. Built by Catholic German immigrants in the small Texas town of Fredericksburg this church was constructed in 1908. The stone used was local, quarried nearby, and it was designed by architect Leo M.J. Dielmann. This church is the picture of stained glass beauty with large and stunning stained-glass windows installed in 1914. It is truly a marvel of American stained glass history and a gem of Texas history. 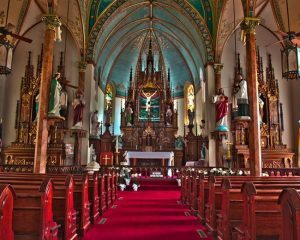 Widely regarded as the ‘Queen of the Painted Churches’, the stained glass in this church is as stunning as it is bursting with Texas history. As a focal point of the entire church, the stained glass is a masterpiece paired with the amazing Gothic vaults and joints. It is one of the most magnificent stained glass marvels of all of Texas. Well loved and preserved, the stained glass in this church will be treasured for generations to come. 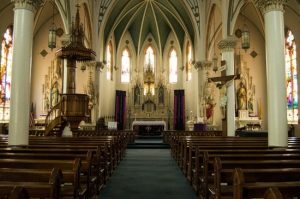 Saint Mary Cathedral in Austin is a historical landmark for many reasons but one big one is– the first cornerstone was laid the exact same year that Austin became the permanent capital of Texas. It was designed by architect Nicholas Clayton who was a devout Catholic and wanted to create a space that evoked beauty found in nature. Stained glass is a very good way to achieve this aesthetic evident by the stained glass we see today in this church. The splendid stained glass windows also depict the reverence for God the Saints had through stories of the many ways to love and serve. At Houston Stained Glass, we feel it is our duty to preserve religious stained glass both because of its symbolic value and its value pertaining to Texas’s long church history. For nearly 30 years we have repaired copious amounts of religious stained glass windows both here in Texas. We are the country’s premier stained glass restoration experts. Contact us today with questions about your church, synagogue or mosque stained glass restoration project and to schedule an inspection of your chapel’s stained glass. Beaumont churches house some of the most inspiring, unique stained glass pieces in Texas. 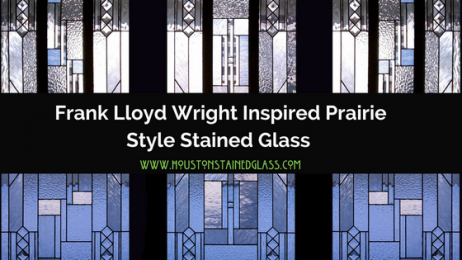 These antique stained glass features can be so significant for the worshiping process offering your congregation members personalized perceptions of religious symbolism. These irreplaceable stained glass windows shouldn’t be underestimated, making restoration an important process to consider. 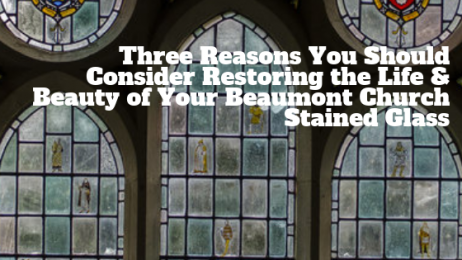 Stained glass restoration provides a multitude of benefits for any Beaumont church. 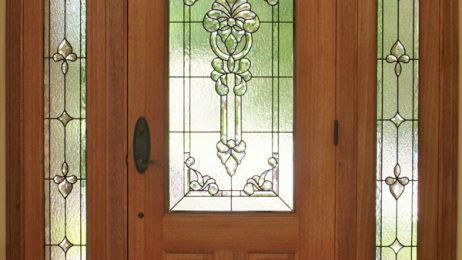 Stained glass may seem like an easy medium to take care of– many Houston property owners assume that they’re low maintenance requirements are similar to other windows and glass products. Stained glass actually requires unique, specialized care that differs from other windows and glass panels. Providing the proper care can actually promote longer lifespan in addition to keeping it in wonderful condition. 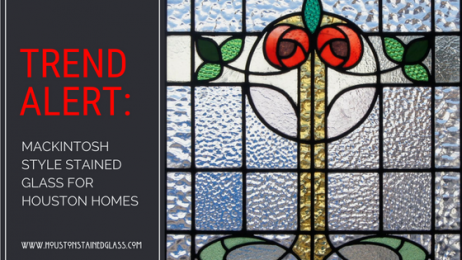 Properly cared for stained glass can really increase property value and improve curb appeal, continue inspiring congregations, attract new customers, and much more. Where Did The Prairie Style Begin? You likely have heard the term mid-century modern because it seems to be all the rage these days. That is understandable because it is a pretty fantastic home style. What you may not realize is this design style and many others were inspired, in large part by a designer called Frank Lloyd Wright. He was a talented and prolific architect/designer who is widely recognized as the grandfather of many different interiors and architectural styles that are still revered and as relevant today as they were when he lived–in the late 19th and early 20th centuries. Much acclaim is given to the Prairie Style which basically was a philosophy of Frank Lloyd Wright invented and had a passion for. 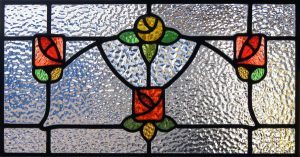 Today it is still one of the most popular stained glass styles on the market, and for good reason–it is lovely. Read below to find out why. When you think about something as simple as the prairie, you probably imagine endless fields and crisp horizon lines stretching on for miles and miles unabated. This type of expanse filled full of light and openness is precisely what Wright wanted to convey in his architecture and stained glass. Dramatic horizontal lines that zig-zagged meticulously without intrusion into the inside or outside world are hallmarks of Wright’s work. He was intensely interested in how light entered a room and considered it, as well as the glass, an integral part of the design of a house. He was obsessed with the integrity of the materials he used, from stone to wood to glass and everything in between. This meant he did not want to try and hide or change the glass but rather allow the glass to exist as itself in the chosen environment. Similarly, he wanted everything he designed in the Prairie Style to harmonize with a natural setting–not interfere. The results, as you can see, were amazing. His work was ahead of its time and considered modern in the 19th and 20th centuries, but somehow had echoes of a simpler, more natural time. It ended up that it was just as at home in the natural world as it was in an urban setting, yet still, the echoes of nature were unmistakable. His use of colors was limited but bold and he had a penchant towards mixing pops of color with mostly clear glass. His intersecting lines allowed his prairie style work to be both outstanding but still at peace the natural world all around. Frank Lloyd Wright was definitely ahead of his time but the sheer uniqueness and breadth of his work, lead us to believe no matter what era he lived in he would still be a pioneer of his day. 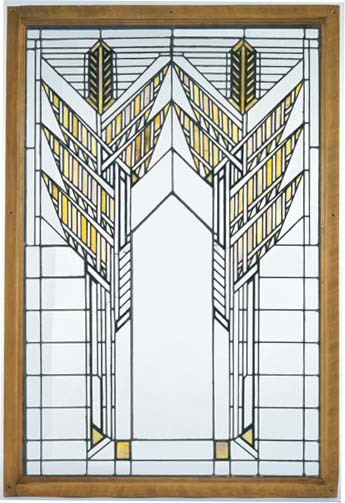 At Houston Stained Glass we greatly respect the genius that is the work of Frank Lloyd Wright’s Prairie Style. We create glass in this style for our customers to honor him and to keep the legacy of artistic perfection alive today. 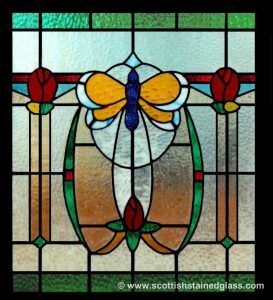 If you are interested in a prairie style stained glass window for your Houston home, contact us today for more information and to schedule a design consultation with one of our Prairie Style experts.